Geocaching is the modern-day version of a hide-and-seek combined with a scavenger hunt. It's a high-tech treasure hunting outdoor adventure activity using GPS (Global Positioning Satellite) technology to locate hidden "caches" which are listed on the Internet at Geocaching.com by their latitude and longitude coordinates. Traditional caches consist of some sort of waterproof container holding a log book and pencil plus various small, inexpensive "treasures". After signing the log book, these "treasures" may may be traded for or added to by the finder. This outdoor sport traces its roots to May 3, 2000, when Dave Ulmer of Beavercreek, Oregon, seeking to celebrate the removal of the government-built-in inaccuracy of the GPS system, hid a single black plastic bucket (containing software, videos, books, food, money and a slingshot) and posted the GPS coordinates on the Internet. The cache was found and logged three days later by Mike Teague of Vancouver, Washington, and voilá, the sport was born! From that humble beginning, the activity has grown incredibly fast, becoming an extremely popular outdoor sport enjoyed by hundreds of thousands of people worldwide. Today there are several Internet sites offering geocaching listings plus a few offering variations on the sport, such as Waymarking and EarthCaching. The largest and oldest of these sites, and a great place to learn more about this adventure activity, is Geocaching.com. Described as the official global GPS cache hunt site, Geocaching. com was created in September 2000, and today lists over 700,000 geocaches around the world. In addition to GPS coordinates, listings include information about the site, such as a brief description, a gallery of photos, comments posted by prior visitors to the cache, and a difficulty and terrain rating scale from 1 (easy) to 5 (most difficult). Difficulty relates to the mental challenge of finding the cache; terrain refers to the physical challenge of getting to it. For many, geocaching can become quite addictive, combining the thrill of the hunt with healthy outdoor exercise, hiking, traveling, and the never-ending tangible treasure of finding unique and beautiful spots on the planet which otherwise you might never visit. One of the best features of geocaching is that it is an activity that is enjoyed by people of all ages and physical abilities. Whether enjoyed as a solitary pursuit or one taken on as a group, geocaching always makes for a great day's outing. Geocachers staying at Casitas de Gila will have the exclusive opportunity of searching for several caches hidden on our own 260 acres. The caches we have placed will appeal to all experience levels of geocachers, as they range from easy-to-find to hard-to-find to hard-to-get-to. There's a treasure to be found in each Casita cache box, ranging from a coupon for a small treasure from our art gallery to a discount coupon good towards a future stay at the Casitas (only one coupon can be redeemed per Casita group during your stay). INTERESTED IN GEOCACHING AT THE CASITAS BUT DON'T HAVE A GPS? Guests at Casitas de Gila Guesthouses who have recently learned about the sport and would like to try geocaching while they are staying here can borrow a GPS from us (cash deposit required, please) to use on our property. We will provide basic instruction on how to use a GPS and explain the rules and protocol for the hunt. If you have a GPS but have never used it for geocaching and would like some pointers as to how to find your first cache, we will be glad to show you how to begin. 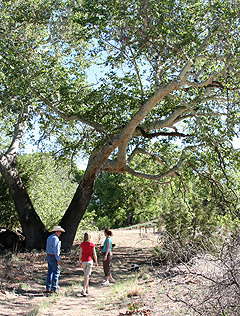 Guests who would like to learn more about the finer points of geocaching before arriving at Casitas de Gila are urged to visit Geocaching.com, which has all the information needed to get started. If hunting for caches doesn't sound like your cup of tea, then you might consider two spin-off outdoor activities: Waymarking and EarthCaching. These both developed from geocaching and also use GPS technology. Waymarking is an activity that marks special locations on the planet using GPS coordinates. These locations are listed on the Internet at Waymarking.com. 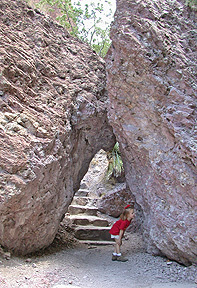 EarthCaching is a educational activity found at Earthcache.org, which leads the geologically curious by means of Internet-listed GPS coordinates to unique geological features around the globe. Waymark record listings on the Waymarking.com website are grouped into top-level categories (called departments) and user-generated sub-categories, which range from being simply useful and utilitarian, to educational, to unique and beautiful, or to some that are, well, just plain bizarre! One top-level category, for example, is the "History and Culture" department which includes historic places and objects significant to world history and culture. Here one will find numerous sub-categories, such as "Preserved Architectural Remnants and Ruins", as well as more specialized sub-categories, such as "Petroglyphs". As of January 2009, Waymarking.com listed over 159,000 waymarks in over 850 user-gernerated sub-categories. If you are into rocks, minerals, geology or any aspect of earth history, Earthcache.org is a must-visit website, particularly if you are planning a long trip by automobile. EarthCache sites are special places on the globe people can visit and learn about unique features and aspects of the Earth. Site listings on the website are administered by the Geological Society of America in partnership with the National Park Service, the Geological Society of Australia, Groundspeak, and others. All listings on the site have been developed by geocachers who have substantial geoscience knowledge and who would like to share their favorite geological treasures with others. Before listing on Earthcache.org, sites are written up and submitted to the Geological Society of America for review and approval. Any geocacher with geological interests and membership in Geocaching.com can then go to the website and print out the detailed descriptions of the sites they wish to visit. As of January 2009, Earthcache.org listed over 4,600 unique EarthCache sites around the world, which are searchable by country, state or province, and type of feature. Geocaching offers a perfect way for people of all ages to get to know some of New Mexico's most spectacular, yet often little known and out-of-the-way places. Unlike many states, the amount and quality of State and Federal land accessible to the public is plentiful. Truely a land of enchanted diversity, New Mexico offers geocache sites in almost every type of physical environment: hot, desert canyons; lush, green prairies; cool, soaring alpine peaks. Caches can range from those easily found just a few steps from your car to caches well hidden in wild places that will challenge your mental fortitude and physical stamina to the limit. Yet as diverse as these caches are, one detects an overriding commonality in their placement, the unspoken thought that seems to have guided many New Mexico geocachers when establishing their new cache: this is one of my most favorite places in all of New Mexico and I really need to place a cache here so that others may enjoy it! New Mexico has an active geocaching community which is well represented by an interesting and informative website: Cache New Mexico at nmgeocaching.com. Here you will find all sorts of local and statewide geocaching information, news and events. 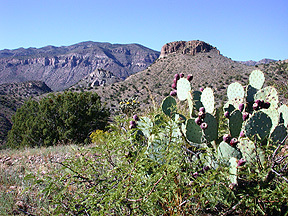 In 2008, New Mexico State Parks set up their 75th Anniversary Geocaching Challenge, where geocachers sought to find caches placed in all 34 New Mexico State Parks. This Challenge was completed at the end of 2008 with 14 cachers or teams of cachers finishing, but all 34 of the caches remain in place, waiting to be found by future cachers visiting the parks. There is also the ongoing New Mexico Challenge, where volunteers have hidden a cache in each of the 33 New Mexico counties. For those intrepid souls who are courageous enough to find all 33 caches, a certificate and medalion await to celebrate their success. 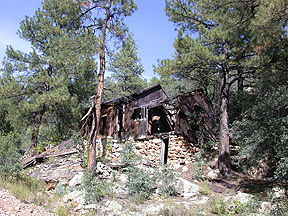 Casitas de Gila Guesthouses offers numerous geocaching opportunities for geocaching enthusiasts, both on the 226 acres of the Casita Lands as well as on the vast nearby public lands of the Gila National Forest, Bureau of Land Management, and state and local parks. A search of Geocaching.com's listings for the Gila Post Office (zip code 88038) as of January 2009 listed 90 geocache records located between 5 and 50 miles from the Casitas. A similar search at Waymarking.com lists over 40 waymark records within 50 miles of the Gila Post Office in 26 categories. 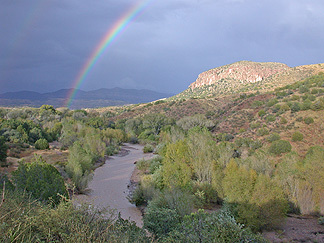 Earthcache.org lists over 30 sites in New Mexico, several of which are located in Southern New Mexico. 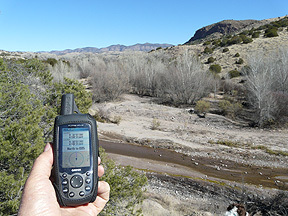 A scan of the geocache listings for the Gila area will show that the range of difficulty and terrain for the caches pretty well matches the landscape itself, with plenty of caches to satisfy all levels of geocaching experience, from novice to the seriously addicted. For example, the site known as Sandy Wash Cache, 13.2 miles from the Casitas with a difficulty/terrain rating of 1.5/1.5, offers a short, easy walk to a hidden micro cache in the Burro Mountains up Saddle Rock Canyon. The Crystal Canyon Cache, 4.8 miles from the Casitas, with a difficulty/terrain rating of 2.5/3.0, will really test your mettle as you hunt for the cache near an old fluorite mine after picking up fluorite crystals along the way. For those who would just like to take an interesting drive or possibly an interesting hike, Waymarking.com lists lots of options. Interested in the history of the area? Then by all means visit the Silver City Museum waymark, 21.9 miles from the Gila Post Office. Or how about a visit to the grave of Kathrine Antrim, the mother of William Bonnie (a.k.a Billy the Kid), less than a mile from the Silver City Museum? 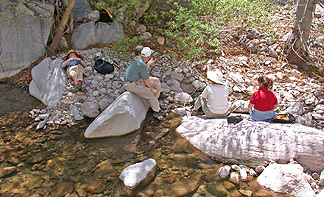 Or for a real challenge, maybe a hike to the Turkey Creek Hot Springs waymark, some 14.4 miles north of the Gila Post Office in the Gila Wilderness. Definitely for the phyically fit, this eight-mile hike is guaranteed to leave you feeling exhausted, yet well rewarded after a refreshing a dip in the natural pool. Several of the EarthCache sites listed at Earthcache.org can be visited on your way to Casitas de Gila or as a day trip from the Casitas, such as the White Sands "Sea of Gypsum" site (White Sands National Monument, east of Las Cruces), Rockhounding 101 site (Rockhound State Park, south of Deming), the Great Divide/Southern New Mexico site (along NM Hwy 9, south of Lordsburg, and the One Tuff Place site (Dripping Springs State Park near Las Cruces). Here on Casita lands we have established several EarthCache sites for the exclusive use of our guests who are interested in geology. We are happy to provide interested Casita guests the GPS coordinates for these sites along with detailed geologic descriptions. Sorry, the coordinates for the pot of gold are classified. UPDATED DEC. 2018 COPYRIGHT ©2018 CASITAS DE GILA, INC.